Yeah, so it’s a little late to take the walk down the Monday “Morning” Sidewalk, but heck, what else is there to do back in good old Denton, Texas? After a number of days helping the parents move to their new digs just outside Houston, huge pondsmall lake included, I got a call from JB to see if I wanted to do a last minute in Port Aransas, Texas, fly fishing off Billy Trimble’s boat for two days – Sunday and Monday. Hit me with a brick! of course I do. 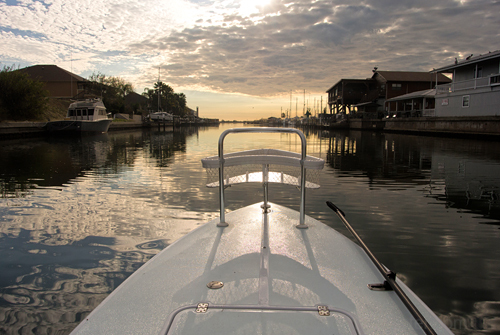 Looking off the front of the Stilt (New Water Boat Works), on the way to the Port Aransas area flats Sunday morning. I wasn’t nearly prepared to sight cast for reds off the front of BT’s twenty-one foot Stilt, but that didn’t matter. Of course you remember my affinity for this part of the coast, and the family “connection” that’s in Aransas Pass, so … road trip. Sunday was interesting. There’s nothing quite like a boat pulling up to the house, stepping down to the dock, handing over gear and a rod, boarding … putzing out of the complex, gawking at the incredible houses, out the gate and getting on plane and off to the flats. To make the story short, we poled around … all over, and BT certainly showed us the lay of the water. As we were poling in the area of the Bass Compound, BT sighted a pair of whooping cranes and poled us in. I managed a series of photographs, but the one below is my favorite. 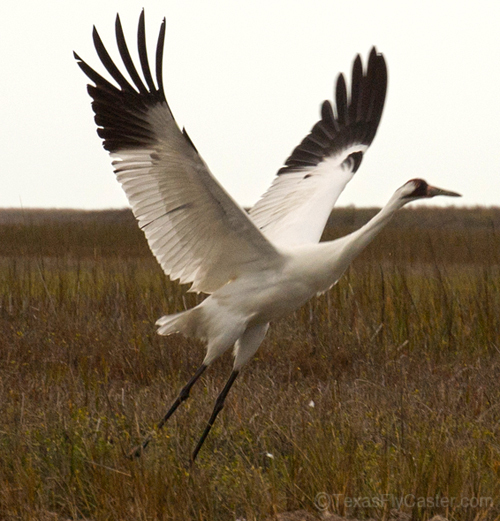 Whooping crane in Port Aransas, Texas, January 2014. Even though we saw redfish (shallow in January! ), the shots weren’t clean, the fish weren’t especially cooperative, the clouds were thick and in the end we had no takes and really no interest from them. No eats. Tough day. One early, and huge heart stopper were two 28-inch trout that BT saw at my 7, and by the time I was able to back hand them, they were off like WWII torpedoes, the biggest trout I have ever seen in person, and big enough to change one’s priorities. And that was really the bonus of being out on the water this day – having BT show me things I haven’t seen, and an extremely rare bird in its natural habitat. Guides, guides with that kind of knowledge and well rounded experience, can really take your day to another level in unexpected ways. COMING THIS WEEK – Water Wednesday takes us to a TPWD meeting in Port Arthur, Texas, last week. What an eye opener! After that, who knows what’s next?